Welcome to Bot Scene! This blog follows the latest developments in humanoid hobby robotics. 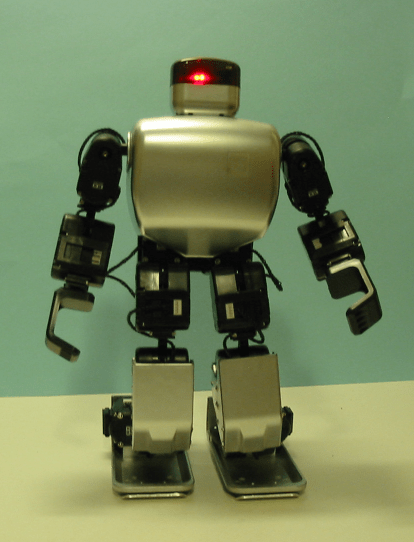 I’ll be scouring the net for news, and also sharing my own experiences and views as a humanoid builder in the U.S.
Cylon-inspired RoboBuilder, customized with a paint job, a Bluetooth control system, and some extra electronics in the head, which was Joe’s entry in the 2009 RoboGames humanoid robot tournament. I’m your host, Joe Strout. By day, I’m a custom software engineer making iOS, and Mac/Windows/Linux apps; by night, a father of two, husband of one, and builder of many (admittedly mostly half-finished) hobby robots. I’ve participated in (and run) some non-humanoid robot events, such as the Trinity Robot Fire Fighting challenge and the Critter Crunch. But I’ve also done some humanoid robot competitions, and let me tell you, once you’ve tried that, you’ll never go back. Unfortunately, humanoid robotics haven’t caught on here in the States nearly as well as they have overseas. Japan in particular has a great community of humanoid robot builders that frequently assemble for informal hacking/playing events, and twice a year, for the big Robo-One competitions that draw thousands of spectators. I believe we can create a thriving humanoid robot community here in the U.S. that’s just as good or better (after all, we do have three times the population of Japan!). This blog is intended to help that along. So, if you’re new to the robotics hobby, don’t fear — everything you need to know to get started will be here (or in the many other great resources I’ll be linking to from here!). If you’ve been spending your time building combat wedges and spinners, and want a more interesting challenge, read on. And if, like me, you already love humanoid robotics, but have had trouble finding a community — join in the discussion, and let’s make it happen!